Margarita Manwelyan has been teaching yoga and meditation classes throughout New York City since 2006. Margarita's teaching schedule includes classes at the 92nd St Y, yoga hikes in Central Park with Hiking Yoga, Sustainable Activism with the Urban Sangha Project, Kids Yoga and Baby Sign Language at Sunshine Daycare, Mommy&Baby Yoga at LSA Family Health Service and one-on-one classes. Margarita is a registered yoga teacher (RYT) and mind body counselor (MBC). Check out Margoshka.com for some of Margarita's video poems, slideshows and reality lit. 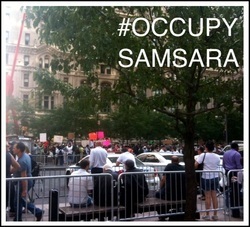 #OccupySamsara is a column dedicated to the heartfelt yearning for all sentient beings to be safe, happy, healthy, and free from suffering. Samsara is a Sanskrit word used by Buddhists to describe the cyclical nature of our own and societal suffering and dissatisfaction. 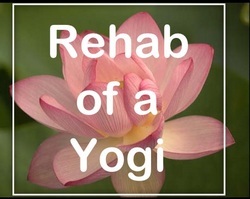 Check out Rehabilitation of a Yogi, my column at The Interdependence Project Blog!